ramatic and positive change in South Africa has seen increased involvement in the wine industry by all ethnic groups and much work and research have gone into improving the quality of the nation’s vineyards. There is no doubting that wine quality at the upper end of the market here is good and improving. An increasing number of dynamic and truly exciting new producers are continuing to emerge. A number of reds of true world class are also being made, some at world class prices too. However South Africa still wants for more wines of such indisputable style and complexity. There has been a recent trend towards micro-production garage-style wines but it remains to be seen how many of these will stand the test of time. 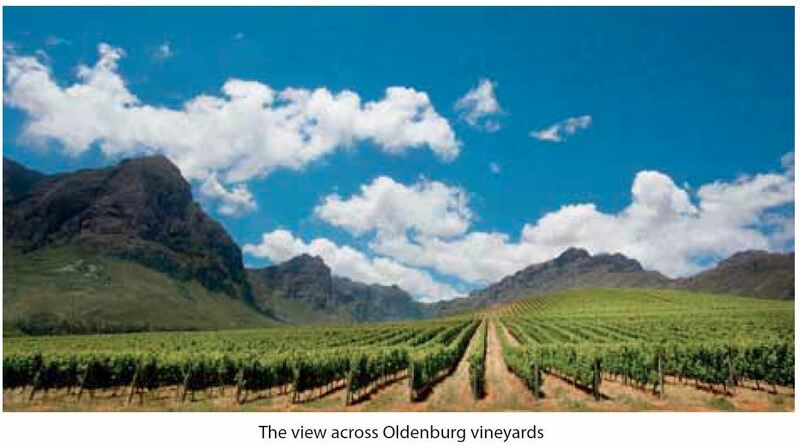 Quality wine production in South Africa is centred around Stellenbosch WO. The region is one of the most attractive to visit anywhere in the world, with towering mountains rising seemingly out of the ocean. Stellenbosch itself is not only home to some of the largest wine companies in the country but also to some of its most impressive. There is a wide variation of mesoclimates within the WO with maritime breezes and the Simonsberg and Helderberg mountains playing a role in tempering conditions. In the coolest areas Sauvignon Blanc and Chardonnay (including some impressive barrel fermented examples) are both successful, as is the occasional Riesling. Chenin Blanc tends to be much in the local style with some residual sugar. Stellenbosch reds are among the best in the country. Pinotage can be particularly striking in the warm vineyards to the north-east of Stellenbosch.Decent Bordeaux-style reds abound and a number of wineries are producing excellent results with Shiraz. Merlot can be good but also a touch vegetal. Although the wines are less rustic than of old and with much of the virus infection once prevalent now removed, a marked minty note found in a number of reds can be overpowering. To the north of Stellenbosch is the second-largest region, Paarl. The area is warm and reds including some very successful Shiraz and Merlot are produced. There are also a number of cooler mesoclimates where the odd decent Sauvignon Blanc and Sémillon are made, as well as Chardonnay and some fine Pinot Noir. White Rhône varieties are also increasingly widely planted. To the immediate east is Franschhoek. The valley here gets cooler as you move east and up to higher altitudes. Again, very good Shiraz and Cabernet Sauvignon are produced as well as earlier ripening whites and Pinot Noir. To the east of Stellenbosch is the cool Durbanville region and newly established Philadelphia. 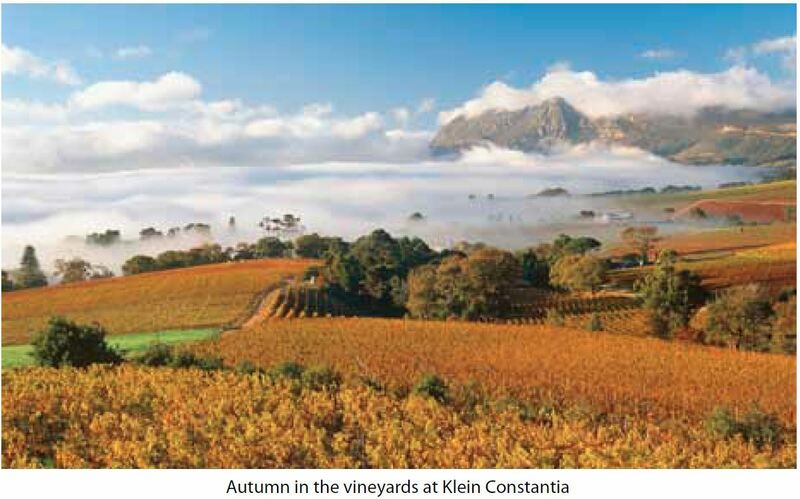 Then south of Cape Town Constantia is home to a small number of good producers. The climate is cool and moderated by both Indian and Atlantic Ocean breezes and whites are more successful than the reds. Some way to the east of Stellenbosch are the regions of Worcester and Robertson. The latter has some potential for good whites grown in limestone soils. The vast, semi-desert and arid expanse of the Klein Karoo, several hundred kilometres inland, sees the production of some reasonable fortified styles but is too hot to produce fine table wines. Swartland just to the north-west of Paarl appears to have real potential. Hillside vineyards planted on well-drained granite soils are the source of good Pinotage, Shiraz and Merlot. The high diurnal variation of mountainous vineyards of Tulbagh to the east of Swartland would suggest excellent potential. Great wines are emerging. 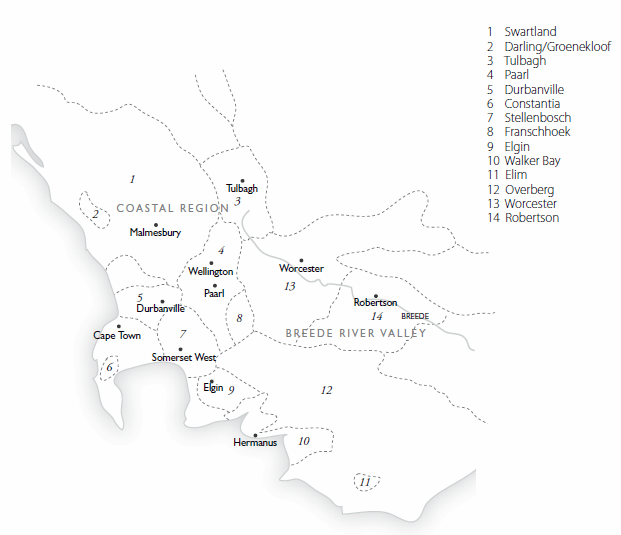 To the south-east of Cape Town is the district of Overberg which includes Elgin and on the coast immediately south Walker Bay is a source of great Pinot Noir and Chardonnay. Elim and Cape Agulhas to the east is centred around South Africa’s southernmost tip and provides great scope for cool grape growing. Swellendam, some distance to the east of the Cape also appears to have much potential.